Supreme homemade swirl bread to go with our hot chocolate or coffee. Sugar free recipe with naturally sweet ingredients for a guilt free pleasure. It’s made with white flour so it’s not that low carb dessert as we could go but again. Who can resist to some treat every now and then? It’s perfect to go with a hot drink. The not so hidden raisins will taste like rays of sunshine on a rainy day. It’s an absolutely gorgeous dessert. Soft, fluffy and surprising. Of course we can add some sweetener to it if we feel like it’s gonna be too bland for our taste. No one will blame us for ruining the perfect harmony that would have existed as no one will know the we have done it. Except maybe our guilty gluttony conscious. 1. In a cup, combine lukewarm milk and yeast. Set it aside. If it gets foamy don’t worry. It’s completely normal. 2. In a large bowl, mix the flour, eggs, butter with the yeast and milk mixture very well until the dough gathers into a ball. 3. 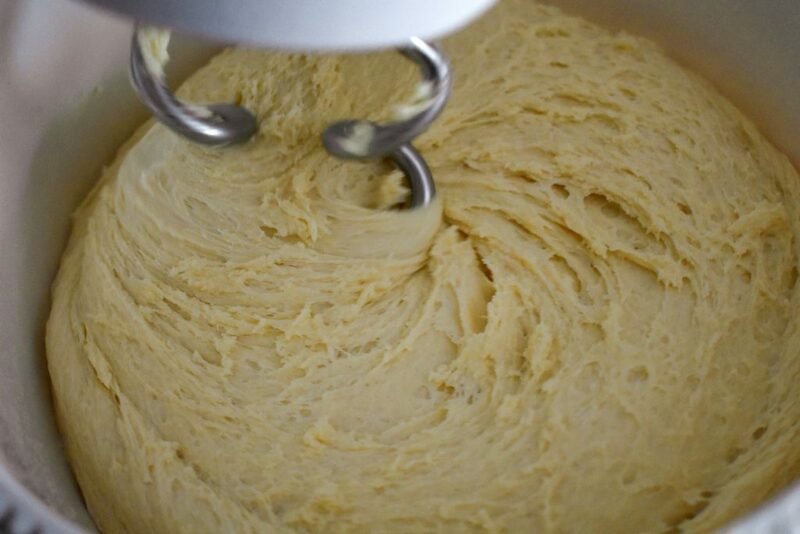 Put half of the dough into another bowl and leave it in a warm place to rise. 4. 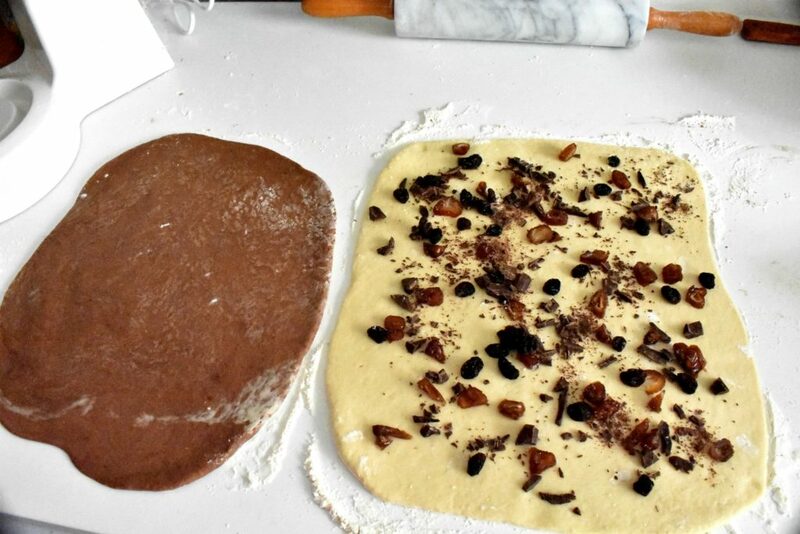 Mix the other half of the dough with the cocoa powder until even. 5. 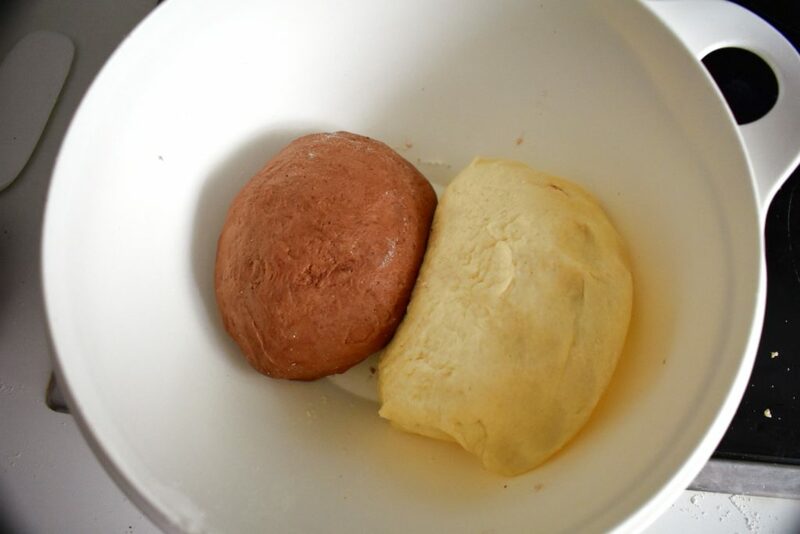 Put the cocoa dough half next to the other half of the dough into the bowl, cover it and leave it in a warm place for another half an hour to rise. 6. Now we have time to get dried fruit ready. If necessary cut them into small pieces. 7. After half an hour turn the dough out onto a lightly floured surface and make 4 balls out of them. 2 cocoa ones and 2 plain ones. Knead until they’re smooth and elastic, leave it somewhere warm for another 20 minutes to raise. 8. 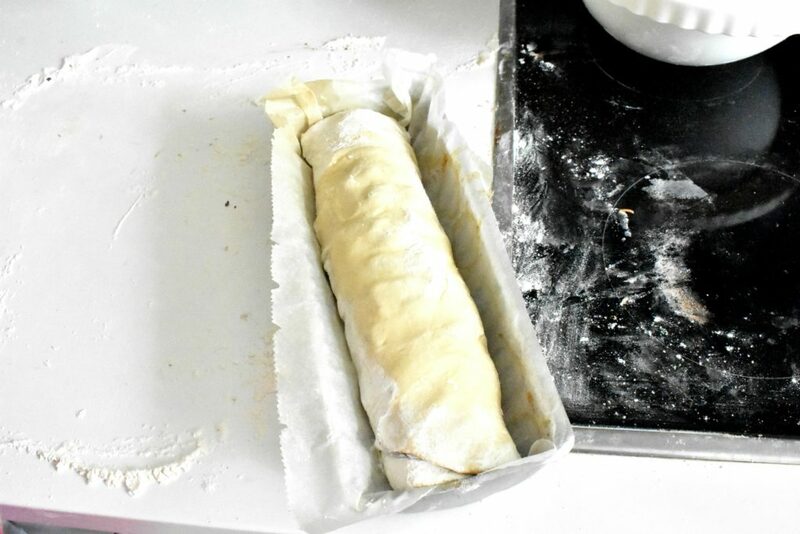 Use a rolling pin to roll one of the dough into a flat square shape as big as the tray. 9. Sprinkle half of the dried fruit and chocolate supply on top. 10. Flatten one of the other color dough into more or less the same size as the first one and put it on top. 11. Roll it up into a rope form and put it on the tray. 12. Repeat it with the other pair of dough. 13. Preheat oven 390°F / 200°C degree and bake it for half an hour. 14. Check if it’s baked with a tooth pick. There’s dough stuck on the tooth pick pop the tray back for another 10 minutes or so. 15. When it’s baked leave it to cool down a bit then we can slice it easier. 16. 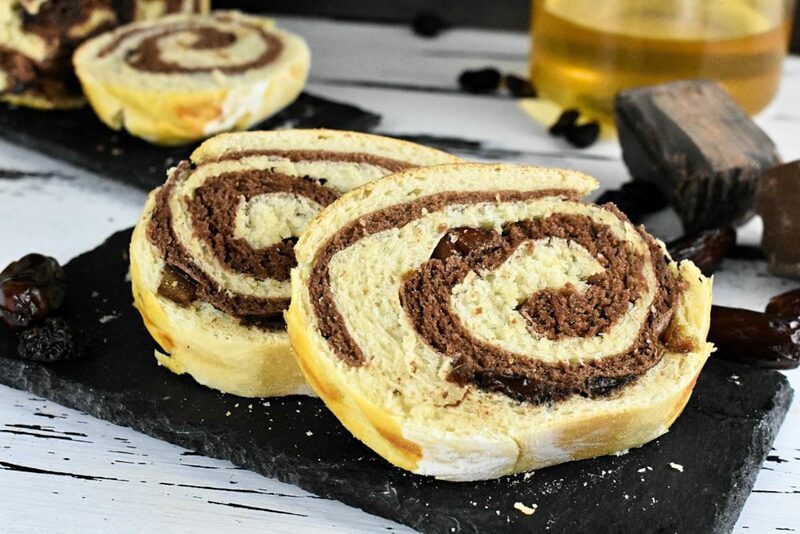 Slice and serve the swirl bread with some hot drink. In a cup, combine lukewarm milk and yeast. Set it aside. If it gets foamy don’t worry. It’s completely normal. In a large bowl, mix the flour, eggs, butter with the yeast and milk mixture very well until the dough gathers into a ball. Put half of the dough into another bowl and leave it in a warm place to rise. 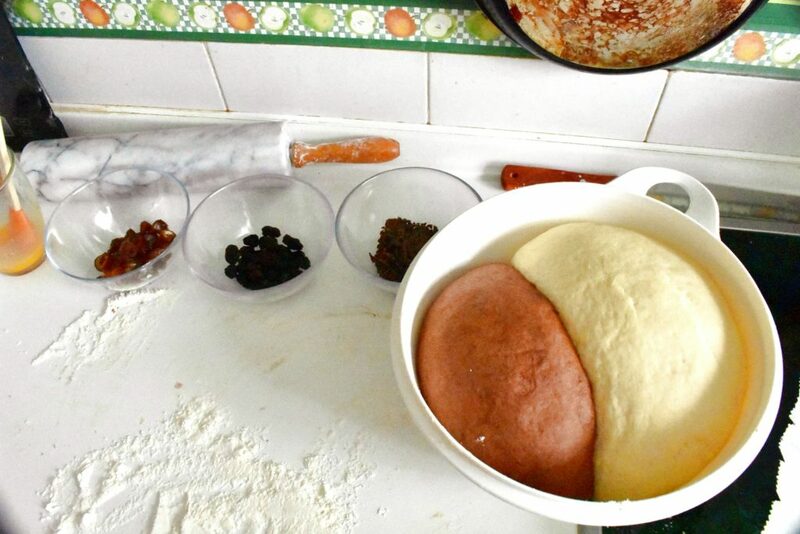 Mix the other half of the dough with the cocoa powder until even. 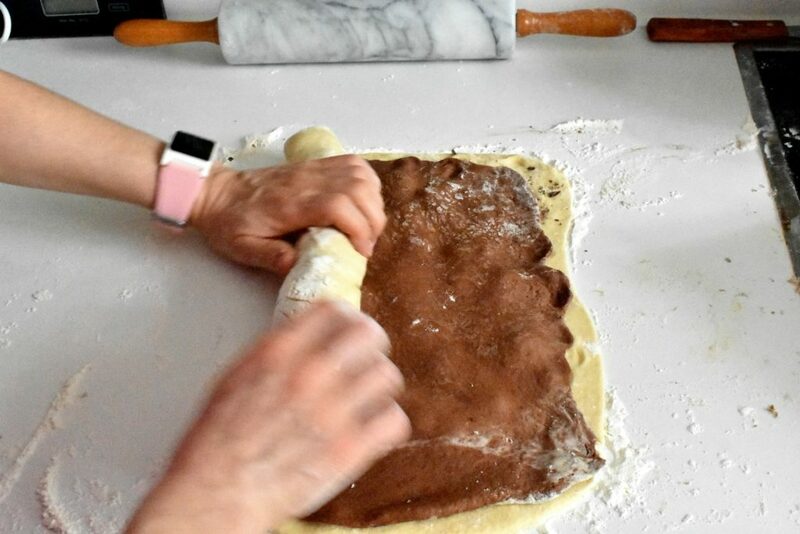 Put the cocoa dough half next to the other half of the dough into the bowl, cover it and leave it in a warm place for another half an hour to rise. Now we have time to get dried fruit ready. If necessary cut them into small pieces. After half an hour turn the dough out onto a lightly floured surface and make 4 balls out of them. 2 cocoa ones and 2 plain ones. Knead until they’re smooth and elastic, leave it somewhere warm for another 20 minutes to raise. 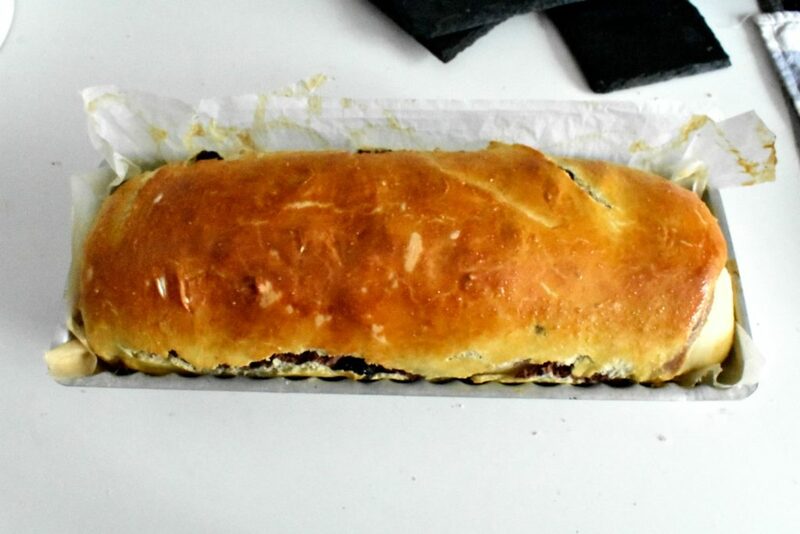 Use a rolling pin to roll one of the dough into a flat square shape as big as our tray. Sprinkle half of the dried fruit supply on top. Flatten one of the other color dough into more or less the same size as the first one and put it on top. Roll it up into a rope form and put it on the tray. Repeat it with the other pair of dough. Preheat oven 390°F / 200°C degree and bake it for half an hour. Check if it’s baked with a tooth pick. There’s dough stuck on the tooth pick pop the tray back for another 10 minutes or so. When it’s baked leave it to cool down a bit then we can slice it easier. 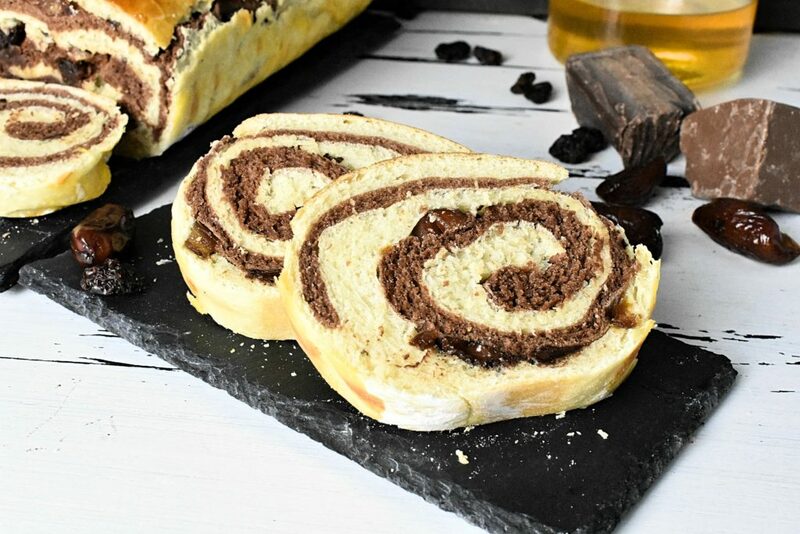 Slice and serve the swirl bread with some hot drink. Hola Nelya, voy a intentar de hacerlo. 🙂 Pero puedes usarlo traductor de Google, si quieres.